I'm getting ready to fly from Oregon to Japan next week for 2 weeks of cycling! 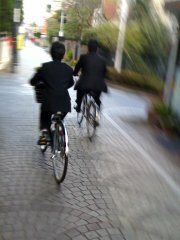 I'm looking forward to meeting my friends -- the staff of Cycle Tokyo! -- who volunteer to take you on a unique tour of this exciting city. Based on my past experiences, here's a list of recommended gear to take along when cycling in Japan. Some things may be obvious, and you may have more to add. Bike gear - besides a helmet and spare tubes (if you're bring your own bicycle), bring a good cable lock, as there are not many bike racks, and a U-lock may not fit; a mirror to mount on the *right* side of your helmet or glasses (you'll be riding on the left in Japan) - safer on congested streets than turning around to look. Water bottles or a hydration pack (water is safe to drink everywhere); Front and rear lights. If you have a bike case or excess gear, you can easily ship it to your next destination via 'takkyuubin' delivery service from the airport, hotel or any convenience store ('konbini'). I did that when I took way too much stuff on my first bike tour. Navigation - a GPS is very useful - http://uud.info/ has Garmin MapSource compatible navigation maps with labels in English. The handiest map books are the "Touring Mapple" series with detailed maps for every region of Japan. Although labeled in Japanese, they show elevation and distance (in kilometers, of course) with symbols for campgrounds, hot springs, fast food (if you're desperate), and 7-11s -- useful to know because their ATMs accept international debit cards. Taking your bike on trains (called 'rinko') - bikes are allowed on trains as long as they are covered before entering the train station and onto the train, so bring a bike bag (or purchase at a bike shop). If your bike has 'big wheels' they should be removed first. If you have a folding bike with little wheels, just bag it and go. Tip: long distance trains, such as the shinkansen (bullet train) have minimal luggage space, but there's usually space behind the seats in the last row of each car to stash your bike. On local trains, use common sense and avoid rush hour. Clothing -- you want to be comfortable while biking, but note that Japanese tend to dress conservative, i.e., less revealing clothing. Japanese cyclists do wear spandex when training, but for sightseeing and visiting temples and shrines, loose shorts or pants or skirt with padded shorts underneath may be more appropriate. Take full rain gear just in case -- June and July are the rainy season, followed by typhoon season, so you can't predict when you'll get wet. Shoes - besides bike shoes, slip-on shoes are handy because you'll be removing them when going inside temples, castles, and other historic buildings, as well as traditional inns ('ryokan'). Make sure your socks don't have holes! Electronics - bring your cell phone if it's compatible with Japan (or rent one at the airport or online - see japanrentaphone.com). Electricity is 100V and most electrical outlets take 2 flat prongs (not 3 prongs like many in the U.S.). If you're coming from a country with 120V you won't need an adapter. Something to share - you'll have a chance to meet and interact with Japanese people on trains, in shops, restaurants, hotels, even school children on the street. Strangers may come up to you to try out their English (or French or Korean...) and ask questions about your culture. If you have some picture postcards, treats or small gifts to share, they will be delighted (and may even invite you to their home). All for now... happy cycling! Bike Event List is here! In response to periodic inquries regarding bike events, we decided to prepare a list of annual bike events held mainly around Tokyo. (Threw in some good events that are away from Tokyo.) Suggestions for events that should added are welcome. Follow the "Bke Events" link, or through the Ride Courses section. Lynette in Japan 2 ! Lynette in Japan 3 ! Here's a link to Lynette's photo galley. Hmm.... It is difficult to choose just 10 out of a million of Ramen shops in Tokyo. After all, there are varieties of tastes, and personal likings are different among individuals. This page contains all entries posted to Cycle Tokyo ! Weblog in October 2009. They are listed from oldest to newest.